This versatile 10-piece set includes 2 Skillets, 1 Sauce Pan with Slide Nonstick, 2 Saute Pans and 1 Stockpot with Sear Nonstick. Two surfaces make the difference. The revolutionary Slide Nonstick surface releases foods effortlessly, essential for creating tender omelettes and delicate sauces. And a specially textured Sear Nonstick surface that seals in flavor to create juicy braised beef, tuna and vegetables. Each surface is designed to enhance the specific cooking purpose of the pan. So your mushroom-gruyere omelette is moist and flavorful and your salmon filets are seared to perfection. The perfect pair - in one set. Calphalon is committed to natural sustainability. That's why they created an industry-first program, Calphalon ReNew, the easiest way to recycle your old cookware. 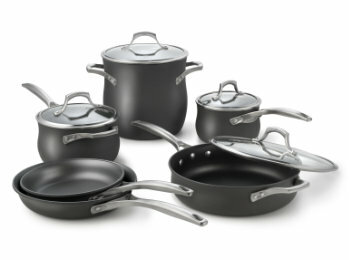 The Calphalon Unison 10-Piece Set includes: 8-in. Skillet 10-in. Skillet 2-qt. Covered Sauce Pan 3-qt. Covered Sauce Pan 4-qt. Covered Saute Pan 8-qt. Covered Stockpot Additional Features: Cook with little or no oils, butter or fats. Cover: Domed, tempered glass with stainless steel rim. Ergonomic, stay-cool handles. Safe for use with nylon, coated and wooden utensils. Free your culinary spirit with Calphalon® Unison™ Nonstick. At last, nonstick cookware that lets you cook like a professional. Two surfaces make the difference. Cook with little or no oils, butter or fats. For me, there's nothing more enjoyable than sitting down to a delicious home cooked meal in the evening with my family. As I've learned over the year's, great cookware can make all the difference when it comes to preparing great food. In the past few year's, I've tried, and failed (miserably) to find the perfect nonstick cookware set. I've had more than one set, and the most recent set definitely looked worse for the wear. Because in reality, it wasn't really nonstick (trust me, many thing's did indeed stick!). Making one last attempt at finding a great long lasting nonstick set, I set off to research some of the current consumer brand favorites, and came across Calphalon. Calphalon was a familiar brand. As an adult, I can still remember (vividly and fondly) accompanying my mother when I was a small child to a local department store, to purchase her first set of Calphalon Cookware (she was as giddy as a child on Christmas morning!). There was an air of greatness about it, and though I didn't understand it as a child, it's easy to understand why, now. Calphalon offers professional grade cookware that helps to cook every dish you prepare, to perfection, and it lasts a LIFETIME! We recently received the Calphalon Unison 10-Piece Cookware Set, and the Slide Nonstick and Sear Nonstick Technology offered in this collection is simply incredible! To have the food that I'm preparing effortlessly release from the pan, without the use of cooking spray (which aside from being unhealthy, causes a HUGE MESS on my cook top! ), butter, or oil, has been a welcomed change in my kitchen. The results have been phenomenal! Instead of tasting the undertones of butter, oil, or cooking spray, we simply taste the true flavors of the food. The shear convenience of being able to Sear on my cook top, and transfer the dish that I'm preparing (in the same pan) to the oven (oven safe to 500ºF / 260ºC) has been wonderful, and has helped eliminate all of the extra dishes I tend to make when preparing our meals. The Calphalon Unison 10-piece cookware set includes every staple piece of cookware, every kitchen should have! Whether your preparing a huge Sunday breakfast like we do in our home (eggs are cooked to fluffy perfection with the Slide Nonstick Technology), family meals, or having a fancy dinner party, the Calphalon Unison 10-Piece Set will allow you to stretch your culinary wings! Go ahead, get out that cookbook! Find all of those recipes you may not have dared to attempt in the past! Because with the new Technology in Calphalon's Unison Cookware, the possibilities are boundless! I like that the handle doesn't get hot when you cook on the stovetop. I love that it will last a lifetime. I own one piece now and I know this is true. I definitely like the Slide Non Stick Technology, what a wonderful feature to have. Thanks so much for hosting this giveaway! I love the non-stick coating, because I also HATE what cooking spray does to the cooktop! <3 the non stick coating!!! I too like the lifetime warranty aspect. I paid $750 about 6 years ago for a 5 piece cookware set from Tupperware that was supposed to be nonstick and come with a 75 year warranty. Within 3 months the coating was peeling off terribly and when I contacted TW about this it took me 3 months to get 2 pieces replaced and guess what? Within weeks they were peeling again! It was terrible cookware and a bad investment on my part. I love to cook (hence why I have a foodie blog) and would LOVE to win this set! I love that you can use the pans in the oven as well as on the stovetop. I love the Slide Non Stick Technology heard these were great set of pans! Great giveaway thank you! I love that it's non stick and will last a lifetime! I really like that they are Oven safe to 500ºF / 260ºC -- I like that I can use it in both places. How handy!! I LOVE that the handle doesn't get hot but yet, they're oven safe! I love the Slide Nonstick and Sear Nonstick Technology so you cook with little or no oils, butter or fats. I love that I can also use it in the oven. I'm most excited that you can use them with little or no oils, butter or fats. I have to mimic the last comment as what I liked best was the same! I find it most exciting that you can cook in these without a lot of oils, butter or fats. I've really tried to drastically cut back on unnecessary fats! I like the fact that the handles stay cool and also that you can use less oil. I really like the fact that you don't have to cook with a lot of oil. Thanks! I love that you can cook with little or no oil. What a great way to save money and cut calories! I Love that you can go from stove to oven! have to take care of these amazing pans.The lifetime warranty is great. The pans looks like food will not stick - excellent feature. The handles are safe to touch too. I Wedding in the family soon, this will make a WONDERFUL gift. thanks for the giveaway. too. I love the non-stick coating feature! I love the slide non stick coating and the life time warranty ~ I also like that they can be put in the oven!! It doesn't get better than that! I have had my pots for so long ~ the Calphalon cookware would be the last set I would ever have to own! I love the fact that they are oven safe to 500 degrees. I love the sear non stick technology and the variety of sizes of pots offered is perfect. What an awesome and beautiful cookware set! Would love to win this! Thanks for the chance. I like that the handles stay cool. I like the fact that its a non stick set and that its a beautiful set. I love that it's non-stick. I already have some Calphalon pans and absolutely nothing sticks to them. Well of course I love the non-stick part but I LOVE that it's dishwasher safe, god forbid I would have to wash it by hand. I like: Cook with little or no oils, butter or fats. Non stick surface and dishwasher safe! Who wouldn't love those wonderful features! I love everyting about this set, so if I have to pick one thing it would be the Lifetime Warranty so I can continue loving everything about them for a long, long time! I do not have an oven safe pan and I like that feature in these pans. I like that they are oven safe which is really a must now a days since we use our ovens more than ever! I love that they can go from stovetop to oven. I love that the Calphalon Unison pans have a lifetime warrantee. I love the Sear Non-Stick Surface! I LOVE the fact that it's oven safe up to 500 degrees! very versatile! thanks for the chance! Nonstick and dishwasher safe at the same time! Lovely! I like the BIG handle grips on the pans and lids!! I have tipped over many pans,lids fallin gon floor from tiny grips.Pot holders work,but not my gloved pot holders! and healthier eating,using less oil in pans! I love that they are 100% dishwasher safe! My favourite feature is that you can cook with little or no oils, butter or fats. I like that I can use them in the oven - perfect for roasts after browning on the stovetop. Love that its dishwasher and oven safe! So useful! I love that it is nonstick. Non stick & the fact that the handles dont get hot. Especially since I have a little one starting to reach to the stovetop! I simply love that they have the Non stick surface and they're dishwasher safe! I really like the lifetime warranty. I'm all about the lifetime warranty! Love the lifetime warranty and the face that I can reduce my butter use! So many great features, mainly being able to cook with little or no oils or butter to make healthy meals. And that the handles stay cool. Lifetime warranty is huge & major bonus for being dishwasher safe! I love the oven safe handles... the I can throw the quesadillas in the oven instead of standing over them. I love the fact that its non stick and you don't have to use butter or spray! I fallen for "non stick" products before only to be disappointed! I am a Calphalon fan from way back! I like the fact that these pans can go from the stove top to the oven without worry AND that this set is dishwasher safe! I'm the most excited about the feature of specially textured Sear Nonstick surface that seals in flavor to create juicy braised beef, tuna and vegetables that the Calphalon Unison 10-Piece Cookware Set offers. I'm excited by the Slide Nonstick and Sear Nonstick technology. I love that they are Non Stick and Dishwasher safe. I like that it comes with a lifetime warranty. I like that they can go in the oven as so much of our meals are cooked in the oven! The stay-cool handles are my favorite feature. I love the non stick technology & that the handles stay cool! I love the whole Slide Nonstick and Sear Nonstick Technology, would love to try that out. Hate cheap pans with bad nonstick coatings. I'm most excited about the 8 Qt. Stock Pot! I love making stews and chili! Perfect for the cold fall and winter months ahead! I have to say I'm excited about the Slide Nonstick and Sear Nonstick Technology and not having to use any fat/spray/butter etc to cook with. I love it's oven safe! oven safe and non stick means awesoeme in my book! My favorite feature is that I can cook with less oils. I absolutely love two features of this cookware: first the lifeline warranty, the last non-stick cookware I had got scratched so easily I finally just got rid of it I was worried about pieces of it ending up in what I cooked. Not very appetizing! I also love that you can really cook without added oil. I'm really trying to cook healthier, that is a big help. I guess I could list severL other things I love but I guess having Michael Symon telling us how good they are-what more do you need?thanks for the chance to win these. I like the non stick, which means less use of oil in my cooking! I like that it's oven safe! I've always wanted a set, but couldn't afford it. I love that it is non-stick and that it can go in the oven. I love the finish onthe pans andthat they clean up easy! I desperately ned new pans and always wanted a set of Calphalon pans but they are expensive! I would be so thrilled to win this set and it would bejust what i need to cook for the holidays! I love that they are dishwasher safe. I hate when things aren't DW safe. I love that they are dishwasher safe! Most pots and pans aren't, and I HATE handwashing dishes! I love the Slide Non Stick Technology! I hate it when stuff gets stuck on my pans and they are hard to clean. I love the fact that you don't need to use a lot of oil or butter in the pans. Cuts down on fats and calories! I like the Ergonomic, stay-cool handles. I love the look of Calphalon and the clear lids! I am most excited that you can cook without coating everything in butter! My fiance is a big fan of that nonstick method! i'm excited about the non-stick feature! I like that it's dishwasher safe. •Cook with little or no oils, butter or fats. I like that it's a full set that comes with everything you need, and you don't have to use much oil or butter while cooking. I like that you don't need a pot holder too hold the handles! I also like that it resists sticking. I like the lifetime warranty and the clear lids! Awesome product! I like that non-stick slide feature!